Easter is just around the corner, and we are glad to inform you that preparations have been made for our annual tournament. The 28th TBAM-BOYSEN EASTER OPEN CHAMPIONSHIPS and the TBAM JRS. PRIMA PASTA 2017 CHALLENGE will be held from April 16 to April 23, 2017 at Superbowl, Makati Square along Chino Roces Avenue in Makati City. As always, an honorary slot is reserved for your association’s official team on opening day. Traditionally, an Easter Sunday Mass shall be celebrated at 11:00 AM, followed by a simple opening program. Changes have been made in the tournament format this year, wherein only Singles event will be played. A total of 2 Singles (3 games each) will be bowled by each participant to determine the qualifiers to the various Masters Finals. Competition will conducted in eight ( Divisions, composed of different age groups and classifications, in order to accommodate more participants with different proficiency levels. The Prize Fund for this year will be more than SIX HUNDRED THOUSAND PESOS (Php 600, 000.00), including Special Prizes for the first five (5) Perfect Gamers. Please furnish us with the names of the players in your Official Team and the name of the authorized person to sign for the games played to be charged to your association. We are also enclosing the Tournament Rules and Regulations for your perusal and guidance. Thank you for your kind and favorable response to our invitation and we hope to see you soon. 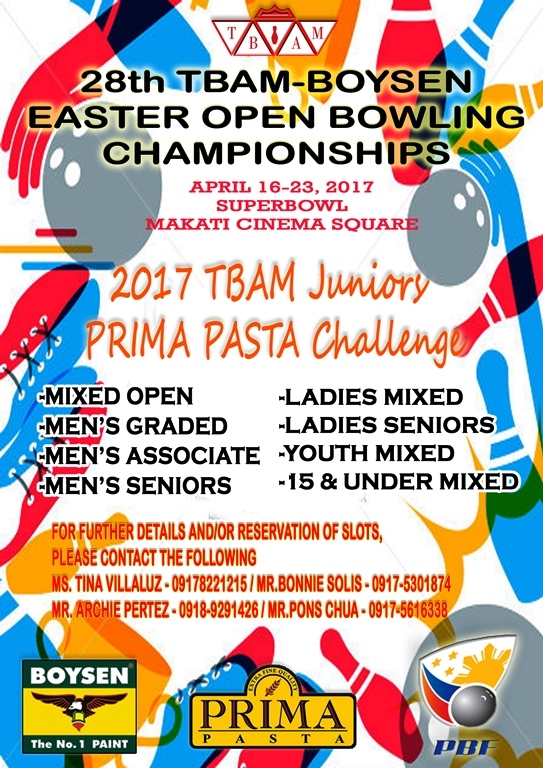 This 28th TBAM – BOYSEN Easter Open Bowling Championship is organized by the Tenpin Bowlers’ Affiliation of Makati (TBAM). ABF/WTBA Playing Rules and Regulations shall apply on matters not covered herein. All PBF members in good standing are eligible to play in this tournament. Bowlers shall be classified according to the latest PBC listing of averages. Bowlers without PBF average shall submit average certification from the respective association attested by the Association Secretary or President. Bowlers without certified average shall be classified as Class O with an average of 196 for Male or 186 for female. The TBAM Tournament Committee reserves the right to re-rate bowlers. Senior men over 60 years old (1957) shall have an additional four (4) handicap. Additional three (3) handicap for every five (5) years over 60 shall be given but total handicap should not exceed maximum of thirty five (35). Senior ladies over 55 years old (1962) shall have an additional four (4) handicap. Additional three (3) handicap for every five (5) years over 55 shall be given but total handicap should not exceed maximum of thirty five (35). 4.3	Members of the National Training Pool and National Youth Team with PBC average below 196 (Male) and 186 (Female) shall be assigned average of 196 and 186 respectively. All entries shall be duly accomplished and the corresponding payments shall be submitted to the TBAM Registration Table at SuperBowl, except those entries which are on “Charge Account”, said entries to be allowed only when the “Charge Account” is accompanied by a blank check issued payable to TBAM. All entries shall be subject to availability of lane and squad. The Tournament Committee reserves the right to accept or reject entry, as well as adjust the playing schedule as the need arises or the situation warrants. All participants must check-in at the tournament counter at least fifteen (15) minutes before the scheduled squad time. The Bowling Center Time shall be the Official Time of the tournament. Games of late players shall be forfeited without refund, and the slot/s shall be given to the reserves. Street clothes shall not be allowed at all times. Rather, bowlers must wear UNIFORMS reflective of their Association, Congress, Federation, Club or Sponsor. Sleeveless shirts are NOT allowed. Shorts are NOT allowed for male participants. Wearing of caps or hats is NOT allowed. Every bowler is expected to be properly dressed for bowling. The Tournament Committee shall not allow a participant to bowl without the required uniform and/or attire. There will be four (4) divisions for the SINGLES Event: Men’s Class O, A, B and Ladies’ Mixed. In the Ladies’ Division, total pinfalls plus handicap shall determine the winners. The Highest three (3) sets of (3) games shall comprise the SINGLES scores. The Top three (3) scores in each division shall be declared as Champion, 1st Runner-up and 2nd Runner-up. Multiple tries are allowed to improve on total of nine (9) games. The Highest two (2) sets of S/Q serves as “Qualifying Series” for the Masters’ Event. Multiple tries are allowed. Last day of qualifying for a specific division will be the day before the scheduled Division’s Masters finals. 8.1	Mixed Open Masters – this is open to all Male and Female bowlers. Top 30 qualifiers (with 6 qualifying slots reserved for Female bowlers), including the Defending Champion (2016 TBAM-Boysen Mixed Open Masters Champion) shall play 8-game series (with +8 handicap for Female bowlers) with lane movement every game. The Top 20 bowlers after 8 games will proceed to the next Round. Scores from the 1st Round will be carried over to the next Round. The twenty (20) remaining bowlers will play another 6 games. Top four (4) bowlers after the 2nd Round will advance to the Shoot-out Finals. Match 1 - The 2nd, 3rd and 4th placers after the 2nd Round will bowl one (1) game to determine the challenger to the Top finisher. Match 2 – Top scorer of Match 1 and the 1st placer will bowl two (2) games, total pinfalls to count, to determine the Champion and 1st Runner-up. Special Prizes shall also be awarded to the Top 3 female finishers who finished below the Top 4. 8.2	Men’s Graded Masters – this is open to Male bowlers with average not exceeding 195. Top 24 qualifiers shall play a 10-game series with lane movement every game. (24 lanes). Positioning based on rank after 9 games shall be done on the last game. Total pinfalls after the 10 games will determine the Champion, 1st Runner-up and 2nd Runner-up. 8.3	Men’s Associate Masters – this is open to Male bowlers with average not exceeding 180. Top 24 qualifiers shall play an 8-game series with lane movement every game. Positioning based on rank after 7 games shall be done on the last game. Total pinfalls after the 8 games will determine the Champion, 1st Runner-up and 2nd Runner-up. 8.4	Mixed Ladies’ Masters – this is open to all female bowlers with average not exceeding 185. Top 18 qualifiers shall play an 8-game series with lane movement every game (with +8 handicap for Associate bowlers). Positioning based on rank after 7 games shall be done on the last game. Total pinfalls after the 8 games will determine the Champion, 1st Runner-up and 2nd Runner-up. 8.7	Youth Mixed Masters – this is open to all Youth bowlers who were born on the year 1996 or after (Please provide copy of Birth Certificate). Top 18 qualifiers (6 Boys / 6 Girls / 6 Mixed) shall play 6-game series with handicap (see Handicap Table 4.4). The Top 10 bowlers after 6 games will proceed to the next Round. Scores from the 1st Round will be carried over to the next Round. The ten (10) remaining bowlers will play another 4 games. Top four (4) bowlers after the 2nd Round will advance to the Shoot-out Finals. Match 1 – The 2nd placer, 3rd placer and 4th placer after the 2nd Round will bowl one (1) game to determine the challenger to the Top finisher. Match 2 – Top scorer of Match 1 and the 1st placer will bowl one (1) game to determine the Champion and 1st Runner-up. 8.8	15 and Under Mixed Masters – this is open to all boys and girls born on the year 2002 or after (Please provide copy of Birth Certificate). Top 15 (5 Boys-5 Girls-5 Mixed) qualifiers shall play an 8-game series, with lane movement every game. Positioning based on rank after 7 games shall be done on the last game. Total pinfalls (Girls +8 handicap), after the 8 games will determine the Champion, 1st Runner-up and 2nd Runner-up. When a tie occurs in any position in the Qualifying and Singles, the bowler with the least difference between the highest and the lowest game (including handicap) of the series, shall occupy the higher position. When a tie occurs in any position in the Doubles and Team Events, the least difference between the highest and the lowest combined scores of the Team (including handicap) of the series, shall occupy the higher position. In case of a tie for the Top 5 positions in any Masters Event, the bowler with the least difference between the highest and the lowest game (including handicap) of the series, shall occupy the higher position. In case of a tie in the Shoot-out matches, the 9th and 10th frames shall be bowled until the tie is broken. Bowling balls used in the tournament must comply with legality rules. Markers of any kind, except inherent marks on the ball itself, are not allowed. The Tournament Committee reserves the right to examine the ball used by the participant. Use of illegal balls is a ground for disqualification of a participant and the erring bowler shall be stripped of all his/her winnings, position or standing. Official score sheets must be signed by the bowlers after each game to acknowledge his/her score. If the bowler fails to sign his/her score sheets, it is presumed that the score is correct and no protest on such basis shall be entertained. For Team and Doubles Events, the designated Captain must sign the score sheets. A tournament official immediately, upon discovery of an error, must correct errors in scoring or in calculation in the tournament play. Questionable errors shall be declared/ decided by the Tournament Committee. Any player who deliberately tampers his/her score sheets shall be disqualified immediately from further participation in the tournament. A frame with missing pin(s), once the ball is rolled shall be treated as a good ball; down pin(s) on the pin deck must be reset. All bowlers are entrusted to monitor and abide by this rule. Bowlers are not allowed to reset / re-rack the pins; only lane men, tournament officials and official scorers are allowed to reset. Games shall be played on a pair of lanes immediately adjacent to each other. If a lane or pair of lanes become unusable for more than twenty (20) minutes brfore or during the squad games, any available lanes provided by the bowling center shall be assigned to affected participants or shall wait for the next available squad. In case of machine breakdown during the Finals, vacant lanes shall be assigned to affected finalist. An interrupted game or series must resume from the point (frame) of interruption. No shadow/practice bowling shall be allowed. When a player chooses to discontinue his/her game during the Finals, a Marshal may designate a pacer. But for Singles, Doubles, Team or Qualifying Events, no pacer shall be allowed. Bowlers must at all times observe the Foul-line. If the automatic foul device becomes temporarily inoperative, the Tournament Committee shall assign Marshal/s to act as Foul Judge. Official scorers are also designated to monitor fouls committed by bowlers. Spectators shall not be permitted to interfere with the calls of duly designated foul judge. Uniform oiling shall be used throughout the tournament, except for the MIXED OPEN MASTERS Finals, where the PBF Kegel Machine shall be used. 19.1	They may claim right of way over anyone moving to the approach or preparing to bowl on the lane immediately on their left. 19.2	Players ready to bowl when it is their turn should not delay to go to the approach if a lane immediately adjacent to them on both sides is clear. Protest must be done in writing and addressed to the Tournament Committee not later than 24 hours after the game in which the infraction was committed or prior to the awarding of Prizes, whichever comes first. Otherwise, such protest shall not be entertained. Under this Rule, protest shall be specific in itself and the decision on the protest shall not be construed to cover a similar or previous violation. The decision of the Tournament Committee is final and cannot be appealed. 21.1	Other than the registered players, only tournament officials and coaches of players/team shall be allowed to enter the bowlers’ area. 21.2	Only one registered coach shall be allowed per bowler. 21.3	When leaving the playing area during the competition, the bowler is requested to ask permission from the Marshal or any tournament official. 21.4	Smoking, eating and drinking alcoholic and non-alcoholic beverages in the bowers’ area are strictly prohibited. No bowler who is under the influence of liquor shall be allowed to bowl. 21.5	The use of powder or any other substances intended to enhance slide on the lanes shall at all times be prohibited. 22.1	The Tournament Committee shall be the sole interpreter of these rules and regulations. Its decision shall be final. 22.2	FIQ/WTBA and PBF Rules shall apply to matters not covered by these Rules.